SHELL’S giant tunnel-boring machine was towed from an isolated crossroads in north Mayo on Friday evening after a massive 12-hour operation by Mayo County Council and oil company experts to remove it. The 170-tonne truck and machine section had been stuck at the narrow Glenamoy crossroads since it jack-knifed there early on Tuesday morning last (July 31), blocking the junction on the L1203 and R312 roads. Sir, – The Barryroe oil find presents a singular opportunity for the Irish nation to begin replicating the economic stability of Norway by securing a stake in sovereign long term energy. The Government holding in Aer Lingus should be sold to Ryanair, (Michael O’Leary does know how to run the airline business), the resultant funds applied towards a 40 per cent stake in the Barryroe field. HUMAN Rights group Action from Ireland (Afri) has condemned both the Garda Síochana and Shell over ‘the bungled transport’ of its giant tunnelling machine, and an Erris councillor has called for a full investigation by Mayo County Council into the incident. HUMAN RIGHTS group Action from Ireland (Afri) has criticised both the Garda Síochána and Shell over “the bungled transport” of a huge tunnelling machine. As reported widely, a 170-tonne lorry transporting the Shell machine to bore the sub-sea tunnel linking raw gas to an inland refinery, jack-knifed at a narrow crossroad in Glenamoy, Co Mayo, last Tuesday morning. An account of Friday's events on the day the tunnel boring machine was moved. As those following the story will no doubt have heard by now, the TBM was moved yesterday. 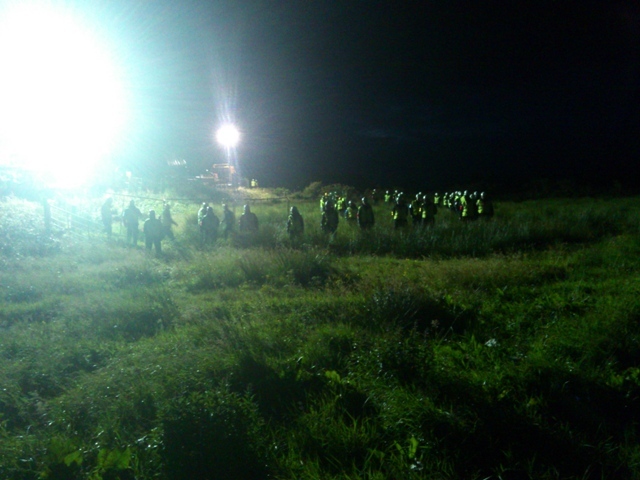 At 4am, gardai began to swarm into the area. 150 IRMS security also marched up the road. We ran up, but the sheer weight of numbers kept us back. Ten managed to get into the field on the side where the truck was listing. Suddenly, 40 IRMS came in and set up a fence. Diggers and trucks of stone came in and for the next ten hours, Shell filled in ditches and built up a road around the collapsed bank. The crane plan had been abandoned and its seemed the field owner had given permission. Thus, without warning the crossroads were closed to all traffic, causing chaos yet again. Shell only later offered its usual bland, 'sorry for the inconvenience' shite. SHELL’S GIANT tunnel-boring machine was towed from an isolated crossroads in north Mayo yesterday evening after a massive 12-hour operation by Mayo County Council and oil company experts to remove it. The 170-tonne truck and machine had been stuck at the narrow Glenamoy crossroads since it jack-knifed there early on Tuesday morning. At 4.30am yesterday more than 100 gardaí escorted a convoy of heavy vehicles to the crossroads for the operation, which involved widening the road to facilitate the removal of the truck. Jobs Minister Richard Bruton has claimed that efforts to rescue a Shell truck stuck at Glenamoy crossroads in Co Mayo could create up to 13,000 jobs. “As well as rescuing the truck, there will have to be several investigations into why it happened. We will need a new, bigger, better road,” Mr Bruton said excitedly. Call out to come to Mayo!